Former Balachaur MLA Ram Krishan Kataria has accused chief parliamentary secretary and SAD MLA Chaudhary Nand Lal of victimising a pro-Congress FCI contractor in a bid to enhance his own business interests. Bimla Devi, a Dalit widow of this village, had never imagined that she would turn so hapless one day that she would have to retain the ashes of her six-year-old son in her house for about a week for want of money needed to go to Hardwar. Fighting CRUEL FATE: Bimla Devi with her three kids. When will MC house get its mayor? A pregnant woman was allegedly poisoned to death by her in-laws in Hargobind Nagar here late last night. Phagwara DSP Harkamalpreet Singh Khakh, while confirming the death, told newsmen here on Sunday that Tejinder (26), daughter of Amritsar transporter Baldev Singh, was married to Jasmit Singh on September 4, 2005. The district consumer disputes redressal forum Kapurthala has directed Bharti Airtel Limited to pay a sum of Rs 5,000 as compensation to a consumer for deficiency in services. The president of the forum AK Sharma directed the firm to pay Rs 2,000 as cost of litigation to Mohinder Pal Singh of Amritsar Bazaar in Kapurthala. One person was killed while 12 others were injured in a head-on crash between a private bus and a truck at Uchi Bassi, 45 km from here on Jalandhar-Pathankot road today. According to the police sources, the bus was on its way to Gurdaspur via Dasuya and truck was coming from Pathankot side. One person was killed and another injured in a fire at cracker factory near Qadian here on Sunday. A big explosion ripped apart the roof of the factory and the debris fell on a man, identified as Suman, killing him instantly. Six unidentified persons took away an Innova car after tying the driver of the car with ropes at Nagoke Gharat village late last evening. The cheaters had hired the vehicle for Delhi from Amritsar. A seven-day Krishna camp and rath yatra would be the major highlight of the world-famous “Burning Man” festival starting in the USA from August 27. This was disclosed by Hindu Chaplain Rajan Zed in the USA while talking to The Tribune on the phone. The work on Hoshiarpur Ayurvedic University project would start soon. This was disclosed by the Punjab medical education and research minister Tikshan Sud, while addressing a state level function, during the 22nd National Fortnight Eye Donation Camp here today. Chief parliamentary secretary and Batala MLA Jagdish Sawhney has asked the Congress leader Ashwani Sekhri to desist from ‘politicising’ issue of removal of rehriswalas from Leek Wala Talab area. Notably, the local administration has started a major anti-encroachment drive. Addressing mediapersons here today, Kataria alleged that the Balachaur truck union along with police officials had been ignoring the directions of the Punjab and Haryana High Court due to the political pressure. The Congress leader said M/s Rakesh Kumar and Vijay Kumar, after being declared the successful bidder, were allotted a contract for transporting rice sacks from an FCI depot at Balachaur to Ropar railway station. From there the sacks were loaded in special trains for further transportation. The contract, which began in 2005, was for two years. “In January 2006, the firm entered into an agreement with the public carrier truck union, Balachaur, for providing the requisite number of trucks for the transportation whenever asked by the FCI,” said Kataria. “However, with the change of government the union started creating problems to hinder the business of the firm at the behest of Nand Lal,” alleged Kataria. “Not only did the union start demanding their own rates but also threatened the firm that it would not be allowed any loading and unloading. The union neither supplied trucks to the firm nor permitted it to use its own fleet. In April, 2007, the union caused hindrances in lifting rice, due to which the firm had to face damages worth lakhs of rupees,” he added. The aggrieved firm filed a writ petition in the High Court. The court directed civil and police officials of Nawanshahr and Ropar districts and the FCI officials concerned to provide the necessary security to the petitioners so as to maintain the choice of operation for their business by hiring independent trucks or by using their own fleet. “But, the union again created problems in July and August. Armed henchmen from outside the district were hired for obstructing transportation of foodgrains,” Kataria said. “As a result of the delay in transporting the foodgrains for nearly 35 hours, the firm had to bear damages at Rs 3,000 per hour. Besides, the FCI could blacklist the firm and even confiscate the pledged property of the contractors,” he said. Kataria accused the police of executing “partial compliance” of the court orders. A pall of gloom had gripped the Dalit family as an electric shock sniffed life out of Jaswinder, the six-year-old son of Bimla Devi, on August 20 when he was playing in a street. Jaswinder allegedly got the fatal shock from an electric pump motor installed by the village panchayat in the street for the convenience of villagers. The death of her son apparently shocked Bimla and her four other children, but what tore her apart was the alleged apathy of the panchayat which had not fulfilled its promise of giving a compensation of Rs 50,000. Not only this, Bimla alleged she was being threatened by the sarpanch and others to keep her mouth shut over the death of her son and his “forced” cremation, otherwise she “would face dire consequences and thrown out of the village”. The panchayat, led by sarpanch Sital Dass, however, termed the allegations baseless. “We have rather extended all type of cooperation to the family. 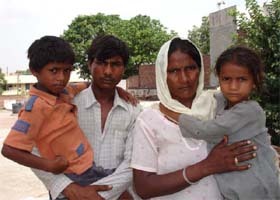 The entire village is with the family in this hour, but her allegations hold no water. We had earlier promised to give her Rs 700 and later I also agreed to give her an additional amount of Rs 1,000 so that they could go to Hardwar. But they refused. All this happened in the presence of a few panches. It was an accident and nobody had brought it to the notice of the panchayat that there was some snag in the motor?” questioned Sital Dass, when contacted over his mobile phone. On the other hand, Bimla and her elder son Ravi levelled serious allegations against the sarpanch and other members of the panchayat. “The ashes kept lying in our home for a week till a resident came forward with a help of Rs 1,000 on Saturday evening. I do household chores in homes of villagers and that does not fetch money to enable us to do anything else beyond bare sustenance. The fault in the motor was brought to the notice of the panchayat, but it was not rectified. Not only that we were threatened to be thrown out of the village if we spoke against the panchayat, the sarpanch and his men resorted to forced cremation of the body of my son even as we wanted to bury it as he was a kid,” rued Bimla Devi, widow of Babu Ram, while talking to The Tribune. She said she had filed a complaint against the panchayat with the Jalandhar SSP. A pregnant woman was allegedly poisoned to death by her in-laws in Hargobind Nagar here late last night. Phagwara DSP Harkamalpreet Singh Khakh, while confirming the death, told newsmen here on Sunday that Tejinder (26), daughter of Amritsar transporter Baldev Singh, was married to Jasmit Singh on September 4, 2005. She was constantly being “harassed” by her in-laws for more dowry and extend financial support to a school being run by them. Baldev Singh said though he had given enough jewellery, valuables, goods and an Alto car at the time of marriage, Tejinder’s in-laws had been repeatedly putting forward their demands. The transporter said his daughter had informed them about the torture she was undergoing on phone a few days ago, following which they told their close relatives in Phagwara to keep in touch with Tejinder. He alleged when his relatives went to her house on Saturday, they were shocked to see the girl in a near-death like condition. They took her to the hospital where she died. ASI Ashok Kumar said a case had been registered against Jasmit, his father Basinder Singh and mother Sartaj Kaur. The postmortem examination confirmed death due to poisoning. Later, the body was handed over to the girl’s parents. The forum observed that the complainant had suffered mental tension on account of unjust suspension of mobile service from April 1 to April 20 and from April 25 to May 15. Considering the documentary evidence, the forum maintained that the firm would pay for damages and cost of litigation to the consumer within a month of receipt of the copy of the order. In his complaint, Mohinder stated that he had two post paid Airtel mobiles (bearing numbers 98761-82887 and 98761-92887). Not being satisfied with firm’s services, he decided to change his billing plan. Singh stated that he had been promised a discount of Rs 200 for the mobile number 98761-82887. “According to the new plan charges, I was to pay Rs 500 with the bill of March 2007 and had been promised a discount of Rs 50 per month” he rued, “But I received a bill of Rs 1,020 from the firm, without receiving any discount and with imposition of late fee.” Later on, his mobile services were terminated. The deceased, who was a truck driver, has been identified as Balwinder Singh of Naru Nangal (Hoshiarpur). The injured included Tarsem Lal (Marota), Saroj (Gambowal), Kamala (Gambowal), Rakesh Dhianu, Gurinderpreet Singh (Khanna), Sumita (Uchi Bassi), Kuljit Kaur (Chack Bamu), Sukhpreet Kaur (Salempur), Rimpi (Nanku), Kaushyala, Khiatri and Yaddi, all of Dasuya. One person was killed and another injured in a fire at cracker factory near Qadian here on Sunday. A big explosion ripped apart the roof of the factory and the debris fell on a man, identified as Suman, killing him instantly. The deceased was taking bath at a hand pump near the building. The shutter of the building was also completely destroyed. A Punjab Roadways driver Satnam Singh who was passing by on his motorcycle, was injured when a cracker hit on his face. A fire tender from Batala was rushed to the spot to control the flames. Police said the blast could be the result of a short-circuit. A case has been registered against Sulakhan Singh, owner of the factory. According to police sources, in his complaint car driver (PB-02-AP-1527) Charanjit Singh, a resident of Kot Mit Singh village, stated that two unidentified persons hired his car for Delhi from Amritsar last evening. During the festival, a temporary Lord Jagannatha temple is built with life-size deities where the visitors pay obeisance to Lord Krishna. This time an American couple will exchange vows according to traditional Hindu rituals at Krishna camp, said Zed. Annabelle Younger, one of the coordinators of the Krishna camp, said devotees from round the globe had contributed to set up the $20,000 camp which would house over 30 people. She said the rath (chariot) of Lord Jagannath had been transported from Vancouver, Canada. The yatra, which will commence on Monday, will continue for a week and culminate on Janmashtami. More than 1,000 people are expected to participate daily in the procession. According to coordinators Rasikananda and Nitai Das, the day would start with a “mangala aarti”. The camp would also host talks on the life of the Lord. The work on Hoshiarpur Ayurvedic University project would start soon. This was disclosed by the Punjab medical education and research minister Tikshan Sud, while addressing a state level function, during the 22nd National Fortnight Eye Donation Camp here today. The function was jointly organised by the Punjab Medical Council (Mohali), Eye Donation Association (EDA), Hoshiarpur and the District Blindness Control Society. “The arrangements for eye transplantation in all the three government medical colleges would be made soon. Registration for eye transplantations would also be done. Besides, another such centre would be set up at Hoshiarpur civil hospital,” said the minister. Appreciating EDA, the minister said, “The efforts of the body in motivating and registering 30,000 donors is really commendable.” He also allotted a grant of Rs 5 lakh to the association for work expansion. Eye surgeons examined around 500 persons during the camp. Active members and the doctors associated with EDA were also honoured.